Homes are full of nooks and crannies that can quickly gather dust, grime, and potentially germs. Sometimes you only remember to clean them when you find yourself on the search for an unpleasant aroma that’s permeating your home. We’ve put together a quick list of places you may have forgotten and how you can spruce them up in a hurry. This is one of those areas you may not notice until you have a stinky kitchen. The kicker—it can be hard to clean. If you simply want to eliminate odors and build up, pour dish soap in the disposal, turn on the hot water, and wait for 30-40 minutes. For tough buildup, you may need something a little stronger than dish soap. In that case, pour cornstarch and a cup of white vinegar down the disposal followed by some ice and kosher salt for extra grit. Last, throw in some lemon juice, turn on the water, and run the disposal. You’re probably thinking you shouldn’t have to clean inside of an appliance that already cleans for you. 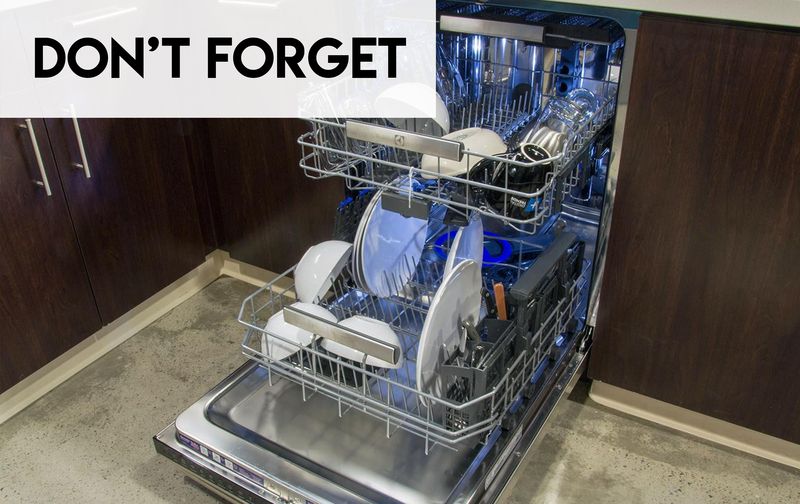 But, you need to do regular cleanings of your dishwasher to remove any food that may have gotten trapped and to make sure it’s performing at peak efficiency. First, clean out any food collected over the filter. If you don’t rinse dishes well, you may have to do this once a week to keep food from spoiling in your dishwasher. Next, run the dishwasher with nothing more than a cup of white vinegar in it. The acidity of the vinegar breaks up stains and buildup. Most people remember to clean the toilet handle but most forget about the toilet paper holder. Germs easily collect on the toilet paper holder because it gets touched when hands are at their dirtiest. Simply wipe it down every time you clean the toilet. These fall under the old saying of ‘out of sight, out of mind’, but they shouldn’t be, especially for those with allergies. Dust collects on these hard to reach areas just like anywhere else in your house. Regularly dusting, sweeping the ceiling with a broom, and removing cobwebs will help keep dust particles under control. If you have allergies, you may want to wear a mask or bandana over your nose and mouth to prevent too much exposure. Do you sit on your couch munching on snacks and flipping through channels? Just think of the germs that have built up over time on the buttons, cracks, and crevices of your remote control. To clean it, dip a cloth in rubbing alcohol and rub down the remote. Use a q-tip dipped in alcohol to reach in between small buttons. Alcohol quickly evaporates and won’t damage your electronics. Cell phones, computer keyboards, and kitchen appliances all need to be cleaned regularly. Rubbing alcohol and a clean cloth can do the trick most of the time. For appliances, you usually only need water but if there’s grease a commercial kitchen or glass cleaner usually does the trick. Most of these hidden places aren’t hard to clean. Add them to your list, and you’ll be sure to reduce the dust and dirt in your home.